North Carolina Electric Membership Corporation (NCEMC) maintains a diverse power supply mix to provide its 25 member cooperatives with the affordable, reliable and environmentally responsible power they use to serve their members. 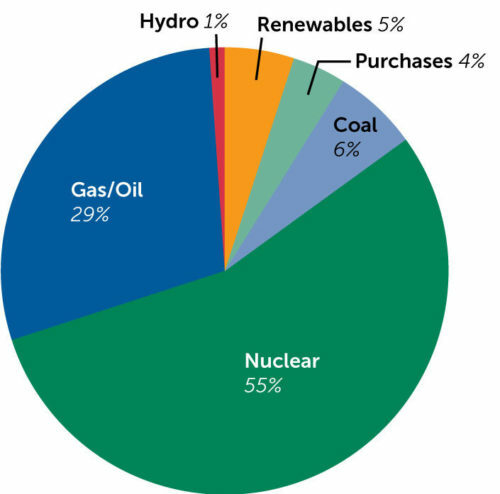 Ownership of a 61.51 percent share of the Catawba Nuclear Station’s Unit 1 in York County, S.C. Ownership and operation of natural gas peak generating plants located in Anson and Richmond counties. These plants provide a combined capacity of approximately 600 megawatts. NCEMC also works with electric cooperatives to meet Renewable Energy and Energy Efficiency Portfolio Standard (REPS) regulatory and compliance milestones. NCEMC is currently looking for North Carolina based swine and poultry waste renewable energy certificates (RECs). To discuss the sale of RECs from your renewable energy facility, please contact us at REPS@ncemcs.com. For owners of smaller facilities, those generally under two megawatts, please see our registration guide for more information on registering your facility.